The words “summer” and “feast” stand on their own to be magnificent things to look forward to, but when combined they truly knock it out of the park. Summer Feast does just that. 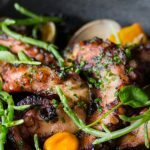 Thirteen of Calgary’s best restaurants have joined forces to offer prix fixe lunches and dinners which range from $15 to $35. It’s a chance to get out to enjoy the rest of your summer while getting a taste for a wide range of restaurants. 1. Brown butter and olive oil ice cream sandwiches from Bridgette Bar‘s $25 and $35 lunch and dinner prix fixe menus. 2. Braised oxtail with collard kimchi fried rice from Anju‘s $35 dinner prix fixe. 3. Charred cabbage with Mimolette and jalapeno salad cream from Pigeonhole‘s $35 dinner prix fixe. 4. Braised line-caught cod from Model Milk‘s $35 dinner prix fixe. 5. Jasper Oven-roasted Taber corn on the cob with spicy garlic butter, queso fresco and crispy pancetta from The Nash‘s $25 lunch and $35 dinner prix fixe. 6. Foraged mushroom soup with chanterelle mushrooms, sherry, truffle pastry spoon and cultivator speckled pea shoots from Market Restaurant‘s $25 lunch and $35 dinner prix fixe. 7. 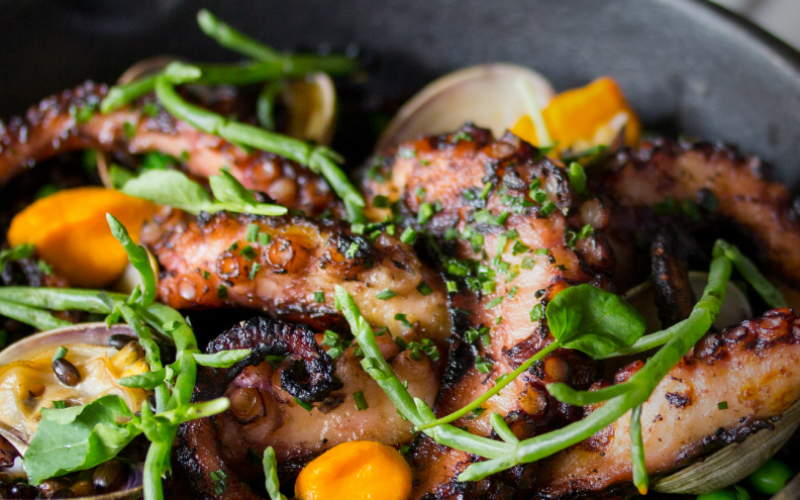 Fire-grilled squid (pictured above) with chunky ginger chilli broth, fingerling potato, charred fennel, radish and coriander from The Guild‘s $23 dinner prix fixe. 8. Alberta trout with grapefruit and broad beans from Whitehall‘s $35 dinner prix fixe. 9. Birch bark smoked chicken sausage with fricassee of bacon, mushrooms, garden chard and lentils from Rouge‘s $25 lunch prix fixe. 10. Miso yuzu creme brulee from Shokunin‘s $25 dinner prix fixe. 11. Grilled endive salad with blue cheese and garlic crumb, candied walnut, maple cured bacon and honey vinaigrette from Klein / Harris‘s $35 dinner prix fixe. Bonus: Foreign Concept hasn’t released its menu at the time of publishing, so we’ll update this list when we see it! The words "summer" and "feast" stand on their own to be magnificent things to look forward to, but when combined they truly knock it out of the park.